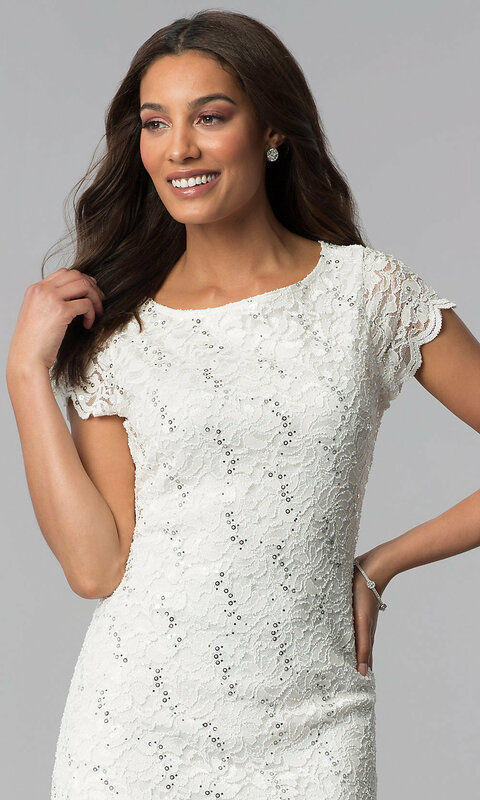 This ivory glitter-lace party dress offers a versatile design that's wonderful for graduations, rehearsal dinners, and semi-formal events. The floral-patterned lace on the little white dress brings a irresistible feminine appeal to the style that is heightened by the sparkling glitter lace overlay. Scalloped edged modest short sleeves and a knee-length skirt elevate the appeal of the short lace dress that is unique yet dainty. Complementing the scoop-neck ivory dress, a tulip skirt wraps up the look of the glitter-lace party dress with an enticing twist. 39", Hollow to Hem 36"